I just don’t have words enough to describe what this painting does for me. It totally took my breath away. Excellent work, Terry. This is really lovely – Great translucence! This is wonderful I love the subtle look and the collage effect. This is one of the best paintings of this type I have seen – it is wonderful. I’ve never used watercolours but do appreciate the skill used in this picture. Creativity and Imagination is what art is all about. Wonderful painting. I honestly love it, good job Terry! Beautiful use of colors – absolutely amazing and very soul touching – thank you for sharing this with everyone and spreading the peace and joy that this world really needs in this age and time – thanks again. I love this — the colours, composition are great !! This is a very colorful, HAPPY creation! Lovely clean colors are prominent and the interesting textures help the eye to travel throughout your painting. I would like to comment on the use of color. 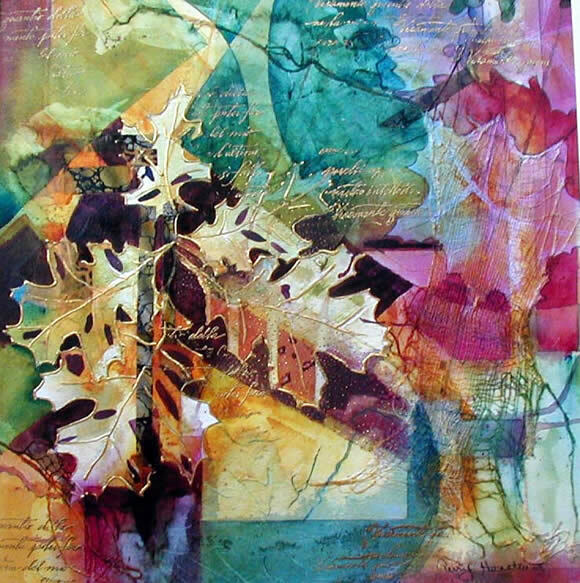 As I squint down at this piece, I am torn between the left side with the dark accents behind those lovely leaf shapes, and then those exciting bright violet and red/orange shapes hugging the right side of the painting. For me the focal area is torn between the two areas. Maybe have those very bright areas so close to the right side of the painting become a little less pronounced. This could be accomplished with a very thin complementary wash over those areas. The color would still be there….it just won’t be as bright and therefore not detract from the focal area with the leaves. This is a very energetic and lovely creation! Thanks for sharing with all of us! Beautiful and inspiring. How about a tutorial showing us your method and techniques? I would benefit and I am sure other watercolorists would as well. Hi Terry, this is such a beautiful painting! I agree, a tutorial showing your methods would be great! Luck, and God Bless you. Love your Water Colour painting, well done. Thank you for shareing and hope to see more.